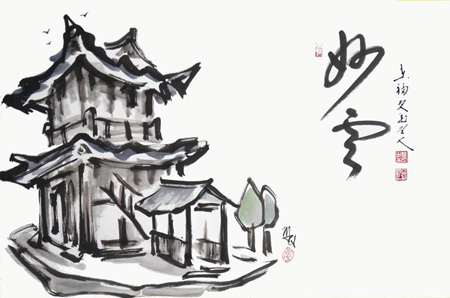 Main Gate, Tofukuji Temple, Kyoto: “Wonderful Clouds.” Calligraphy by Fukushima Keido Roshi. The work was all done during Michael’s long stay in Japan. 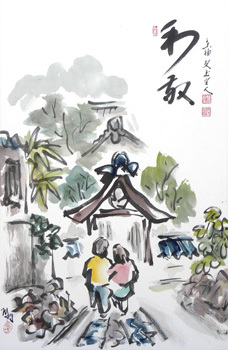 Sumi-e (ink painting), some with color, mostly collaborative works with calligraphy by his teacher Jikihara Gyokusei and Fukushima Keido, the former abbot of Tofukuji temple in Kyoto. Many of the paintings were inspired by classical Japanese poetry and the modern haiku of Taneda Santoka. 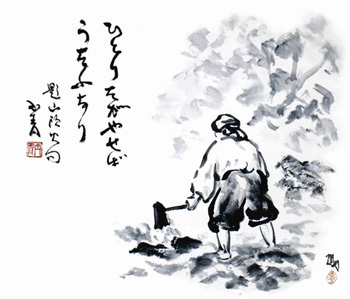 “Plowing the field, One Hears a song” – poem by Taneda Santoka. Calligraphy by Jikihara Gyokusei Sensei. Michael Hofmann grew up in the San Francisco Bay Area, but spent most of his life in Kyoto as a painter and disciple to the sumi-e painter and Zen priest Jikihara Gyokusei. Jikihara Sensei died in 2005 at age 101. Michael has had solo exhibitions of his work in galleries and museums throughout Japan, and has illustrated various Buddhist classics, including The Hojoki and The Sayings of Layman P’ang, as well as Liza Dalby’s novel Hidden Buddhas. You can see his paintings on the sliding of doors of Sowing the Moon teahouse at Green Gulch. “Respect One Another.” Calligraphy by Fukushima Keido Roshi. Michael will be presenting An All Day Ink Painting Workshop at City Center on October 7, 10 am – 4 pm, with Dana Velden.